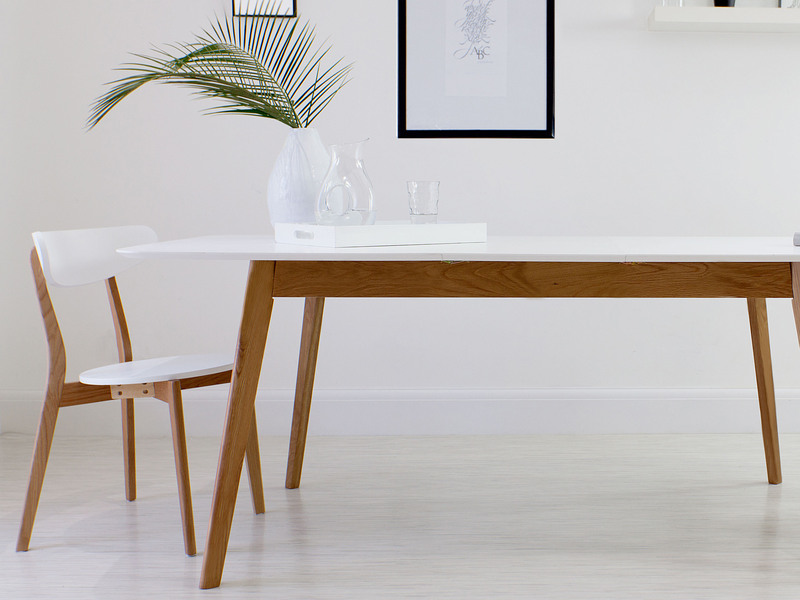 The Aver Oak and White Extending Dining Set is all about coordinated contemporary style. With the matching finishes of the table and chairs, this set will instantly bring a warm and welcoming feel to your dining space alongside a designer, modern flare. The Aver Oak and White Extending Dining Set also provides ample room to seat you friends and family, due to its easy to use butterfly extension leaf. This dining set is definitely a stylish and practical seating solution for your home. The matching finishes of the Aver table and the Senn Oak and White Dining Chair make them an obvious yet harmonious pairing, creating a sleek, coordinated and designer look. It also takes away the need to choose different chair colours and finishes, as this has all been done for you! 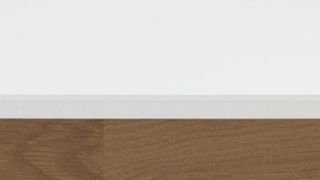 White is a perfect combination for the wooden legs as it brings a modern edge to the more traditional look of the oak. 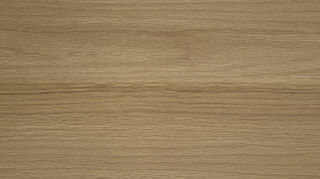 The oak creates a tactile and warm look, allowing this set to really add a warm and welcoming feel to your dining space. The Aver starts off as a 4 seater when not extended, moving to a 6 seater if you place a chair at each end of the table. When it is extended, the Aver table can happily accommodate 8 people, making it perfect for sociable and flexible dining. The style of the Aver is a simple four legged apron construction with a butterfly extension, which is concealed in the top of the table. This is a handy design feature that is very rare in a table of this price point. 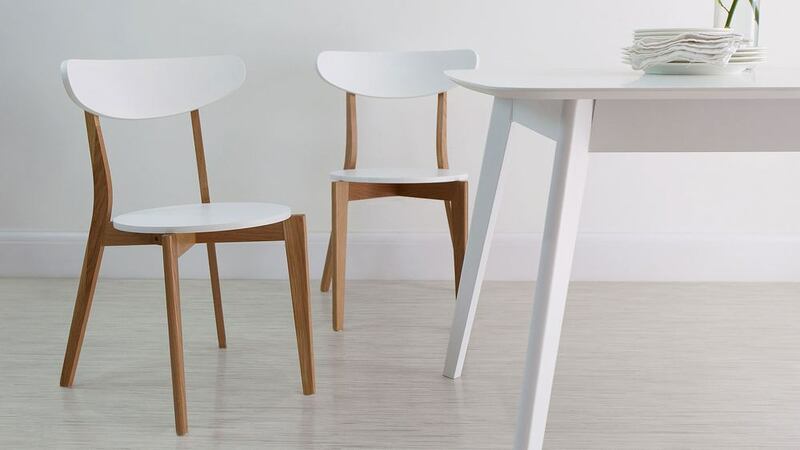 The Senn Oak and White Dining Chairs are stackable and can be stored away when not in use to free up more room. This makes them an ideal pairing with an extending dining table as you can easily stack and store away the extra seats when they are not in use. 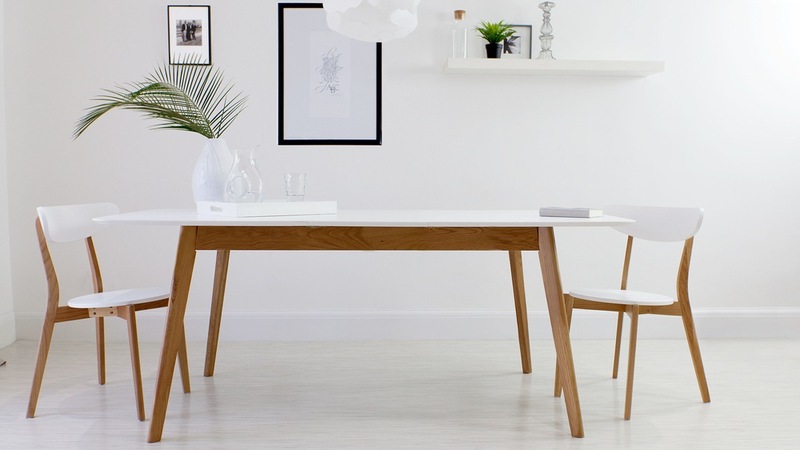 This gorgeous dining set is all about sleek, gentle curves. 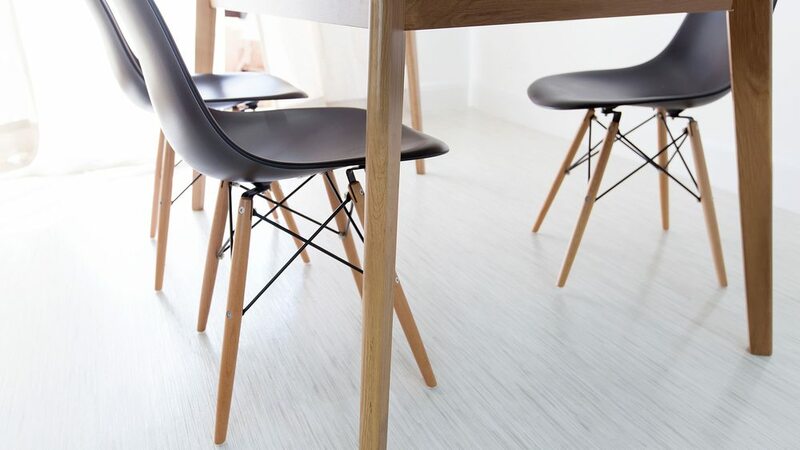 The table top edges are chamfered which gives the Aver a slim profile, while the seat backs on the chairs are shaped into an arc to gently support your back. 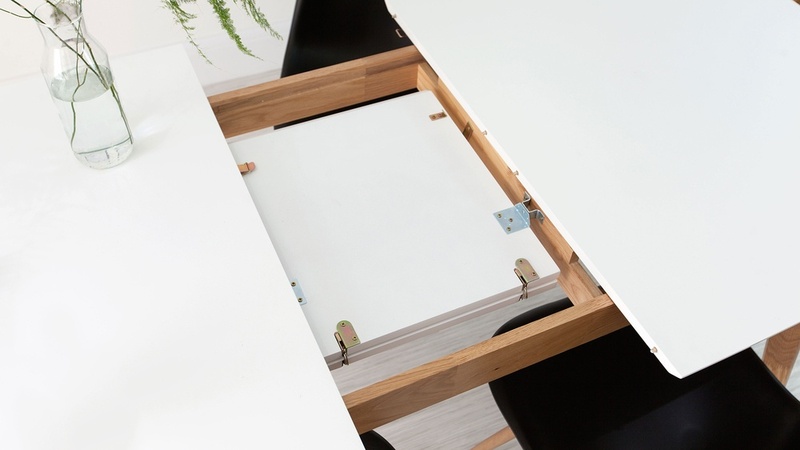 The table top corners have also been slightly rounded off so there are no hard edges or corners to bump into, making it much safer around you and your family. This dining set would work perfectly in an open plan dining area. It's casual and informal which means it would be ideal for that kind of multifunctional transitional living space. 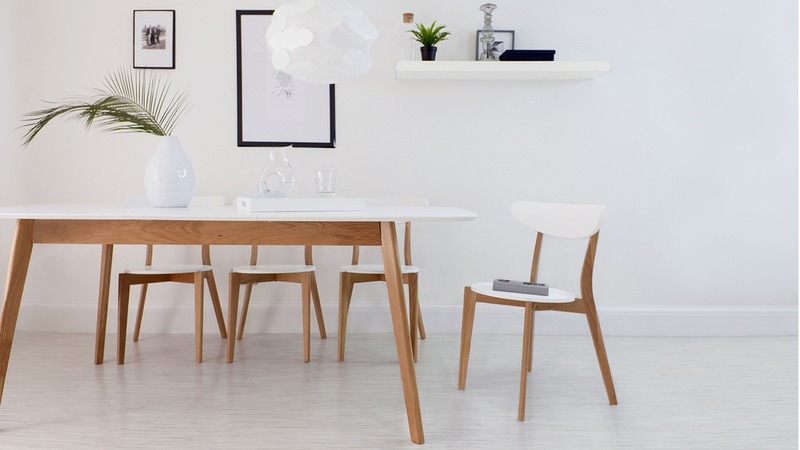 You can view the Senn Oak and White Dining Chair and the Aver Oak and White Extending Dining Table separately for more information on the individual products. The Aver table is also available in white and a grey and white combo so why not browse the range and see what other styling options we have to offer.